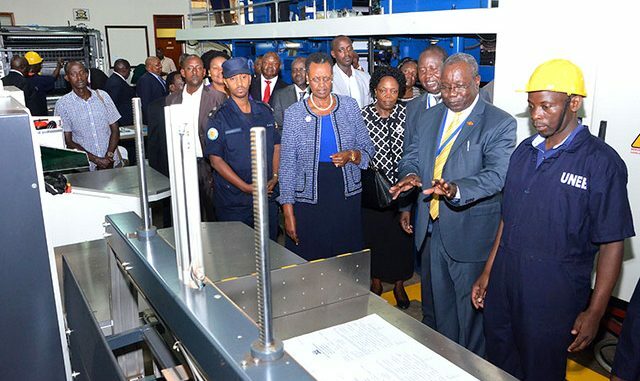 Dan Odongo (2nd R) explaining to the Education minister Janet Kataha Museveni how the Uneb printing press works earlier. Courtesy Photo. The recent leakage of Uganda Certificate of Examination (UCE) examinations papers has been traced to Iganga district. 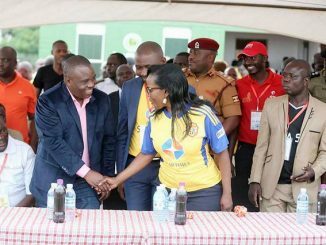 The confirmation comes a week after media reports indicating that examination papers were circulating on social media long before they were done by the candidates. 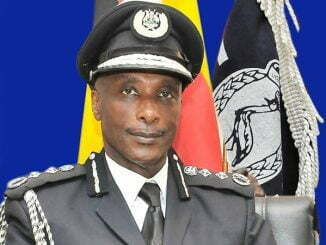 Uganda National Examinations Board (UNEB) executive secretary Dan Odongo says preliminary investigations have traced the leakage to storage station in Busesa. He adds that the area supervisor and scouts have since been arrested to aid investigations into the matter. 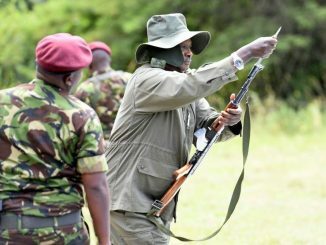 “The scout sent to guard the exam confessed that he was paid Shs 1 million to give his keys to perpetrators of the fraud,” Odong told journalists in Kampala today. According to Odongo, over 26 people from various districts have so far been arrested in relation to the examination leakage. Of the arrested; five were from Entebbe, five from Rwizi, four from Rwenzori west region, two from Serere, one from Amuria, nine from Kampala and one from Iganga. They include private school teachers, a student, a director of a private school and bursar of a government school among others. He however adds that UNEB was still pondering the next course of action.